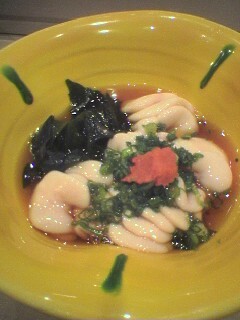 “Shirako” is “whiting”, or in more prosaic terms, male fish sperm sacs. It seems to be an acquired taste even for the Japanese. The most available kind is that of “tara”, or cod. Do not confuse it with “tarako”, which is the exact opposite as it means female cod roe! Other kinds, more expensive and tasty, are those of “tai” (seabream ) and “fugu” (globefish). as a “tsumami” (snack) with ponzu, momijioroshi (grated daikon with chili pepper) and some finely chopped thin leeks. Fresh seaweed is optional. As a sushi, either on top of a gunkan. Ask your sushi chef to season it, so as to avoid the chore of dipping it into shoyu, or, if your chef is a real expert, as a nigiri. The last might seem difficult. Actually, there are two tricks to stabilize the “shirako” on the “shari” (rice ball): coat the the “shari” with chopped thin leeks, or put the “shirako” on a “shiso” (perilla/beefsteak plant) leaf, place the “shari” on top, press very lightly and turn it over!